Earth Day/Spring Math Activity: Do your students struggle to compare fractions? Do they need a fun, motivating, hands-on way to look at fractions? 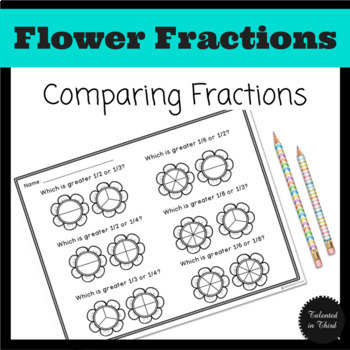 This freebie has students comparing fractions by coloring in the flower fractions and then deciding which one is greater. There are two different versions of this freebie. The color version starts on page 5 and goes through page 6. The black and white version starts on page 3 and goes through page 4. To complete, students will need to color in each fraction shown above each flower. This will mean students need a basic understanding of what a fraction is before completing this activity. • Use the color version as a center/laminate to use again and again. • Use the black and white version as independent work/practice before a lesson. • Use the black and white version as an assessment to see how students are doing during your fractions unit. • Use either version at your teacher table as a small group lesson. There is a set of 2 pages (black and white or color) that are purposely identical to reflect different ways of asking the question/allow you as a teacher to differentiate to meet the needs of your students. The first is the basic question of comparing which is greater, the second requires students to use the symbolic symbols of greater than (>), less than (<), or equal to (=).